How does this paragraph make you feel? Because I feel alright. Like all is well and as it should be and my only human task is to ride the wave of life, be aware of what is and react in a positive way that supports the humans, animals and earth around me. That may seem a bit far out there to you at first, but let me put it into context: I work as a Visual Arts teacher of young children, so I can’t help but relate this idea to the ways of the educator and the way we manage our learning space. Take for example “you’re not forcing anything and you’re not being forced” from the passage above. Traditionally, classrooms have been spaces that have a full-plated agenda and many tasks that must be followed to meet the goals of that set agenda. Maybe your state mandates a set of benchmarks, hence being “forced” and the teacher must “force” this agenda on her students. I have led many activities that begin with a step-by-step demonstration and follow with students forcing those same steps in the exact order to produce a product that looks quite similar to the one I made in the introduction of the activity. This type of teaching does have great success, if a specific product is what your are wishing to achieve. I am not undermining the need for goals, but I am challenging the way we go about achieving our goals with students. Recently, I have tasted something that has opened me up to who my students really are, what they are capable of and how I can be the one who can “move with them, flow with them”. I can be the adult who meets them where they are and supports them on a personal and more meaningful path of learning. Don Buckley gave me my first taste of how leaning into what is can help teachers become more aware of where problems begin and therefore more successful at solving them. This process has a name. It is simply: Design Thinking. Don taught me that my students already have the answers; that they are holders of an endless amount of innovative ideas and that they are capable of fulfilling tasks that I may have already pre-fabricated for them. During a one-day workshop, Don encouraged participants to roam the campus asking students about the qualities of their best teachers. These simple interviews would later be used as data to inform a new product to benefit teachers and students. It’s so simple, right? If you want to know what students are getting out of their school experience, then gee, why not ASK THEM?! And this is why I have given myself over to the question. That curvy and confident open-ended interrogative clause that screams “I can be anything”. But these questions are not confined. They do not ask: “What color is this?”, insinuating a proper answer. Rather, they curiously wonder: “What do you notice about this color?” These questions leave so much space for creativity. They value risk taking and they thrive on possibility. If you are an educator, you may be thinking: “Oh that’s totally Inquiry-Based Learning !”, and you are right on. Leading a learning experience with guiding questions, or a Query if you’re teaching at a Quaker school, puts students’ questions at the center of a curriculum. But my story does not end here, rather it just begins. Because inquiry has led me to feel comfortable with “moving and flowing and swinging” with what is. Using Inquiry-Based ideas to guide my teaching has enabled me to accept what is happening in my studio, ask questions that further dissect a situation and decide where to go next rather than take control and drive it where I think it should move to. Bernie Glassman comments on swinging with what is: “You’ll get more done because you are allowing the creativity to flow”. Which brings us to the intersection of Inquiry and Improv. The first rule of Improvisational Theater leaves no space for contradictions and praises the phrase “Yes, and…”. It asks you to accept where you are, notice the temperature, and make a helpful move to support the group. Can you think of a more clear mirror image of what teaching offers to us each day? Have you ever felt a pain in your chest when you direct a student to a place where they were not naturally headed to just because you had a deadline? Or tried to manipulate the environment in a way that just was not mean to be? That is a clear sign that you are trying to control rather than accepting reality. So I gave up my need to control every minute of instruction time, took up improv, and have been using a Design Thinking approach to empowering my students and building their self-efficacy. At the start of every school year, all artists in grades 2-5 construct a portfolio, a 24” x 36” paper folded in half and taped at the two shorter sides. In the past, I have demonstrated where to fold, how to tape, where to place your name, etc. This past year I stopped controlling the framework and simply began by asking students a few guiding questions: “What is a portfolio? Why do we need it and what do we use it for? How can we make it more fun to use? stronger, easier to navigate through? interactive?” No more forcing for me, I was putting it all on my young artists because they CAN handle it. And so they blew my mind with ideas. I was fueled by “Yes, and I have these tiny envelopes that will be a great size” and “Yes, and you can attach it easier with this tab”. The ideas belonged to THEM and I was a supportive figure offering materials and simple skills to help manifest their innovative ideas. Don’s courses on Design Thinking have also helped me ask thoughtful questions to achieve the juicy answers I really want but didn’t know how to get. Take end of the year assessments, for instance. In the past I have utilized a questionnaire or a one on one interview but never found out deeper ideas about my students as artists. Until I asked my fourth graders what it was like to be a fourth grade artist. And this is an example of what I got back. Look at these complex illustrations of what happens in a young artists brain. Pure Brilliance. There is so much information there in pictures that I can use for a juicy discussion. And now I have a deeper awareness how capable my students are and can use this data when designing future assignments. “In life you’re always in a band and you’re always swinging”. The passage at the top is from The Dude and the Zen Master by Jeff Bridges and Bernie Glassman. If you are a fan of The Dude and dig anything Zen, it is a joyful ride. I’ll leave you with a few wall spreads of encouraging playing cards that my fifth grade artists designed in September to fuel a year of creative thinking and risk taking. I challenge you to begin your units with curious questions. Remember what it feels like to be in charge of your learning adventure and what types of steps spark your sense of wonder and generate pure excitement and motivation. And then please tell me about it! Have you ever been in a situation where you felt a little bit helpless and a little bit unsure? That’s good. Yes. It is good. Guess what? You don’t have the answers to all of your problems and when you are able to embrace an awareness of that fact, and let it sit for a while, you are creating the causes for creativity to be born. When I am faced with a problem, my first response is to solve it. Give me that quick fix so I can attach the bandaid, wipe my hands clean and move on. My mother is infamous for preempting her response with “Here’s what you need to do…” and it drives me insane. Most likely because I see a little bit of that in myself, and because I wish she could just listen and let things be. There is a theory that states when people come to you with a problem, it is helpful to that person if you simply listen and let them know that you understand their feelings. In a TED talk and a new online course, Brene Brown shares that having empathy means being strong enough to just be with someone where they are. No judgment, no sharing advice or “how to”, just an ability to be in that space, whatever it may be, with another for a while. The unsettling, ambiguous and often helpless emotion you may experience is HUMAN. So, wait, how is this connected to a Growth Mindset? 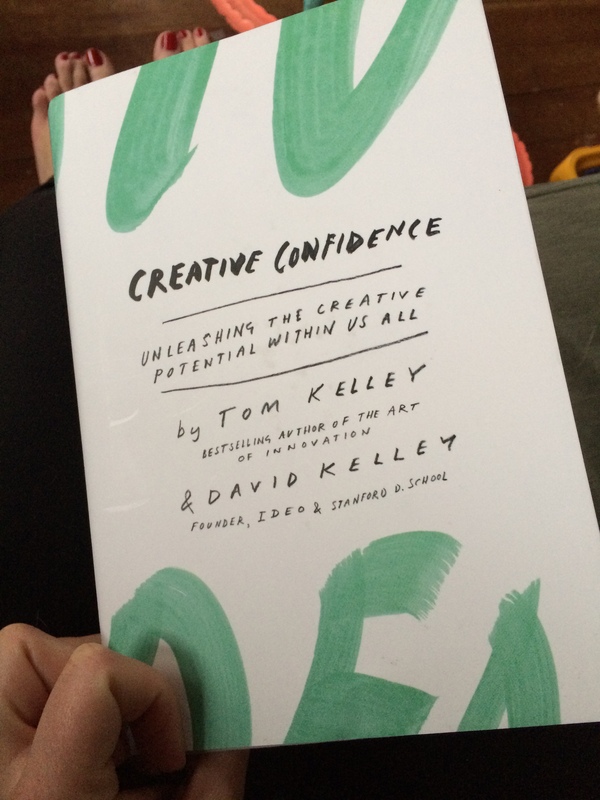 In Creative Confidence, Tom and David Kelley claim that a fundamental prerequisite for developing creative confidence is the belief that our capabilities for innovation are not set in stone, not fixed. They suggest that as “analytical thinkers, an unresolved issue hanging in the air is uncomfortable.” And in those situations, is it the uncomfortable feeling that drives us to search for and offer the quick fix. Creative thinkers who exercise a Growth Mindset recognize that there are many possible solutions and have the courage to utilize an open mind, thinking big and wide first. This helps them to become aware of a number of possibilities before settling on a single idea. People who have a growth mindset are comfortable to wade in the pool of uncertainty. They are willing to just be where they are for a while. So, the next time you are faced with a situation that brings up these unsettling emotions that make you feel helpless or unsure, try to pause and notice what you are feeling. Know that these emotions are human. Get pumped for this new opportunity, a challenge to swim in the unknown. Think of it simply as an experiment to see where it will take you. Reflect on the experience. And then tell someone about it.